Pictures for this Chapter Coming Soon, Enjoy the story for now. Sesshomaru and Rin have much more time together now that his heirs take care of many affairs of the empire. Sesshomaru and Rin take romantic walks around the scenic areas of the empire, they take trips to the human village to visit old friends and they visit the beautiful family forest. The family forest is very private and secluded being accessed only by Sesshomaru and his family. Access to his family forest is near the empire and the only way to get in is to use a special secret hidden entrance that is not seen to demons or humans roaming about the area. An ordinary looking cube that is medium sized but small enough to be held with one hand is the secret passage way to enter the forest. Once it is placed on the ground and struck three times,it enlarges creating a door in which to enter and once inside, the door dissappears and the small cube bobs in the air of the family forest until retrieved again to leave the area. Exiting the forest is the exact same process. Sesshomaru and Rin are the only ones that possess the cubes for entry at the current moment however Sesshomaru plans to leave cubes to each of his three children as well as one for Jaken in the near future. One afternoon Sesshomaru and Rin decide to enter the family forest to enjoy the atmosphere and beauty of the land, they make love there as they did once before they were married. Rin loves the feeling of being open and free, making love below the fantastic blue skies and the alluring ambiance is a great thrill to her. Afterwards, they bathe, swim and kiss in the blue lake that is so calm and relaxing. They return to the shady tree and Rin lies there bare, resting her head on Sesshomaru's fluffy white boa as he dresses and sits against the tree. He smiles at her relaxed and carefree mood as he caresses her hair. She takes notice of the scenery as she is lying on the ground admiring the calm deep blue lake, the appetizing fruit trees that she and Nephra grew in addition to the huge, gorgeous cherry blossom tree that shades the middle of the forest. She comments again as she has many times before, "It is so beautiful here...sometimes I really hate to leave." Sesshomaru agrees and comes up with a plan that he thinks will make Rin happy, "When I am ready to retire the empire and pass it on... If I were to create a small castle here, Just for you and I to live out our last hundred years in...would that please you Rin?" Rin sits up as this idea is extremely satisfying to her, she had never thought of it as she responds, "Oh that would be absolutely wonderful; That would please me very much." Sesshomaru continues informing her of his plan, "We could have a small group of my most loyal demon servants remain with us. We can visit the outside as often as we like and the children will have access to visit when ever they please." Rin is overjoyed with the idea of living out their final 100 years in such a serene, fantastically beautiful forest and so, Sesshomaru decides he will have his demon empire begin working on building the small castle at once. Meanwhile Sesshomaru's children are dealing with their own life situations and problems. Zephra is still on a mission to make herself one of the most notorious and power female demons known thoughout Japan. Nephra has fallen in love with a demon that is a servant of a most sinister ruler and her father's worst enemy Zeref. Though her future husband plans to leave Zeref's empire, she feels his loyalty to Zeref and her loyalty for her father will come between them somehow. Suzaku is hesitant to inform Zeref of his intention to marry Sesshomaru's daughter because he is aware that Zeref will not be at all happy with it due to the fact that he would need to leave the empire. He also knows that Zeref will most likely hold a grudge, possibly taking his anger and retaliation out on his soon to be bride. Suzaku fears for Nephra's safety and her life so he decides to keep not only the proposal of marriage secret but the entire courtship as well, until he can figure out a safe way to reveal all. Suzaku continues to serve Zeref as he normally would being careful to ensure that his trips to the West are unknown and that no one is following him, he advises Nephra to do the same all for the sake of her safety. Suzaku stands in front of his master after being summoned by him, the subject of Zephra comes up again even though many months have passed. Zeref asks, "Suzaku...You assured that you were going to bring the girl to me, Lord Sesshomaru's daughter Zephra. I am aware that she was clever enough to escape your grasp however my orders have not been carried out as of yet." Suzaku explains, "Yes master, she was a stubborn one. She did not want to come willingly and taking her forcefully turned out to be quite a challenge." Zeref inquires, "So why have you given up on the task I have set forth? Many months have gone by since I requested her presence." Suzaku answers, "Master, I have not given up on the task, she is very difficult to locate. Last I saw her, she was at the empire convention with Heroshya; it would have been impossible for me to bring her at that moment and I have not seen her since, despite my efforts to find her." Zeref orders, "Suzaku, I will hear no more of this nonsense. Her father rules the Western lands therefore she is likely to be found there. Find her and bring her to me, do not disappoint me again." Suzaku says he will find her and bring her to him but he knows that this is an impossible mission to do being engaged to her sister. Suzaku asks, "My Lord, my I inquire....What reason would you need to see her, If I can provide her with a reason she may accompany me." Zeref informs, "Yes, she just might...Tell her I mean her no harm and that I only wish to meet the beauty who dominated the demon tournament and who is now well known among the lands." Suzaku flies off to seek Zephra. He knows he will not kidnap her or try to force her because he will soon be apart of her family but he hopes that he will be able to get Zephra to come with him back to the castle willingly so that it will appear to Zeref that he is following orders while at the same time keeping his relationship with Nephra and her family in tact. Nephra does well to keep her relationship with Suzaku a secret from her father also, she does not want him to ask her father's permission to be married until Heroshya gives his blessing first. She also continues business for her father's empire as usual and does not talk about her engagement to anyone but her siblings. When she informed Zephra her response was surprisingly understanding as she asked, "Do you really love him?" Nephra informed, "I do, I know we have only known each other a short time but I feel we are well matched. I know he will make me happy." Zephra asks her, "Well what will you do about Heroshya, it sounds as though he will never permit a marriage." Nephra tells her, "He says he will not allow the marriage because we don't know each other well enough but I will have to convince him that Suzaku will make me a fine husband, though I don't think that is what's bothering him, there's something else he's not telling me." Nephra knows Heroshya well and can tell that he is not sharing the real reason for why he doesn't want her to be married to Suzaku. When Heroshya comes to the castle to speak with his father he finds himself too exhausted to take the trip back to where he normally resides with his mother and decides to retire to his bedroom. Nephra sees this as her opportunity to speak with him regarding her engagement, she has only one chance to convince him to change his mind and give his blessing so that she and Suzaku can move forward with their future plans. Nephra knocks on Heroshya's door and asks if she can speak with him a moment. Heroshya knows what she wants but he welcomes her into his quarters anyway because he always finds Nephra a pleasure to be around. She sits near him on his bed and says, "Heroshya, I need to speak with you about Suzaku. Your refusal to approve our engagement is putting a strain on us; reducing us to keep our relationship secret and deceive those we are loyal and faithful to." Heroshya tells her, "If he loves you, he should declare his love outright to anyone. There is no need to keep it a secret." Nephra informs, "He is keeping it secret for my safety, not even he knows how Zeref will respond, we only know that he won't hurt Suzaku but he may try to kill me so that Suzaki will be free again and I am unable to tell father if you will refuse to praise Suzaku as my future husband." Heroshya asks, "Suppose I were to agree to this marriage, whose side will you choose and whose side will he choose? Where will you both live? It is a mistake Nephra, not a good match at all. I can see he does genuinely care for you but marriage between enemies is a ridiculous thought to consider." Nephra informs him, "We will not serve in the East or the West, we have already decided to live a quiet, peaceful life in a demon village in the North or South, away from both empires. That way, neither of us has to choose a side." Heroshya asks, "So he plans to take you away from the Western lands does he? It's as I suspected. I will not allow that either, how do you think father and your own mother will feel about you living on the North or South side of Japan with a demon that once was a servant of father's worst enemy." Nephra answers, "You and I both know that If you gave your blessing, they will trust him and not worry about my well being. Heroshya, I love him...Please find it in your heart to bless our union, it would mean so much to me." Heroshya remains sitting on the bed looking straight ahead saying nothing, his face is like stone as he refuses to give in to Nephra's desperate pleading. He finally speaks as he says, "I suppose if I continue to refuse you will be cross with me?" Nephra looks at him, shakes her head with a smile on her face, she puts her arms around his neck and kisses his cheek, "You are my only brother and I love you very much, Nothing will ever change that...not even your stubbornness." She leaves the room as Heroshya thinks to himself: I hate the way she can so easily warm my heart with her words and her smile. I will not yield on this, I won't let him take her to some far away land where I will never see her again. Nephra is a beautiful girl, she will find someone else that is able to serve under father's empire so she can remain right here. Perhaps this is selfish of me but she and I have become so close, I will miss her too much if he takes her away. The answer is still No, she will forgive me for this, I know she will. It takes Suzaku until the next afternoon to locate Zephra as she is walking again through the woods in the same place he found her before. 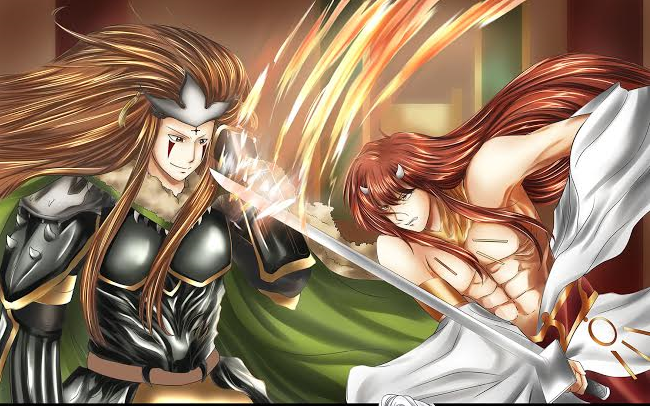 Zephra can hear a rustle in the trees and quickly unsheaths her sword as Suzaku tells her, "Relax, It's just me." She puts her sword back in it's sheath as she says, " What are you doing over here? Nephra is at the castle." Suzaku informs her , "Actually I have been looking for you all morning. I really need your help with something. I have a bit of a problem, Zeref still wants to see you. He ordered me to bring you to the castle." Zephra responds, "Hmmm, sounds like a personal issue to me." Suzaku replies, "Zephra listen, I don't want to tell Lord Zeref about Nephra and I. If you come with me to the castle, he will think I'm still doing what he asks and I won't have to devulge any information. If you don't want to do it for me,then do it for Nephra's sake." Zephra thinks about it for a few moments and then says, "Why is he so determined to meet me?" Suzaku replies, " I'm sure you're aware that word has spread about your fighting skills in the tournament, Apparently he is quite impressed with you. Trust me he has no intention to harm you but I suspect he is going to see if he can get you to fight for him in return for some high position at his empire with the hope of eventually getting you to turn against your own father." Zephra laughs hard, "Ha Ha, What a ridiculous thought, Why do you serve him Suzaku?" Suzaku shakes his head, " I don't always agree with his methods and ideas but I owe him a great deal...Nevermind, are you going to accompany me or not?" Zephra tells him, "Alright, this should be interesting." Suzaku warns her, "Nephra can't know I'm here and she can't know where you are going. She will only worry about your safety and insist on coming. I don't want her near Zeref." Zephra replies, "puh, yet you ask me to risk my life...presenting me to your insane master." Suzaku replies, "Don't worry, I assure you he will not harm you. If that was his intention..he would have told me. Anyway, I will personally make sure you return here safe, you have my word." Zephra replies, "Oh I am not worried at all, I could actually use a little excitement. I have found myself quite bored most days since the demon tournament ended." Zephra retrieves Au Un for transportation to the East lands and travels with Suzaku to see Zeref. Once at Zeref's castle Suzaku and Zephra walk up, Suzaku stands in front of Zeref and informs him, "Master, This is Zephra...daughter of Lord Sesshomaru. She was gracious enough to accompany me of her own free will, she informed that she was interested in meeting you as well." Zeref walks up to Zephra slowly as he says,"So you are the one I have heard so much about. I am even more pleased with you now that I am seeing you in person." he lifts her right hand and kisses the back of it as he continues, "Your beauty is astounding to me." Zephra requests, "I am a very busy woman Lord Zeref, What is it that I can help you with?" Zeref ignores her question still marveling at how attractive she is, "You resemble that beautiful human woman that Sesshomaru kept with him, what was her name...." Zephra responds, "Her name is Rin, she is my mother." he widens his eyes a bit, "Ah, so he married her did he? She was so beautiful however you are even more so than she." Zephra informs, "I do appreciate your flattery but I really must know, why was I summoned here?" Zeref dismisses all of his demons for privacy while Zephra stands nearby, she notices Zeref is surprisingly handsome in his humanoid form with hair the color of fire and deep golden eyes; he is tall, muscular and young looking although she knows he is much older. Zephra had not imagined him to look in such a way. Suzaku wanting to keep his promise to Zephra asks Zeref, "Master, I promised the princess that I would see her back to the Western lands. I would prefer to stay until your visit with her is complete." Zeref tells him in a somewhat annoyed voice, "Yes fine, very well." quickly turning his attention back to Zephra, " I understand you are very much devoted to your father, Great Lord Sesshomaru. He has been a worthy adversary, still refusing to fight for me or battle me for control of his empire. I know that you are in search of ultimate power and control just as I have always been. When I heard of you fighting in the demon tournament, I knew then that you were as headstrong and hungry for power as I once was. I can help you gain more power and position amongst other demons. Your name is already known throughout the lands but I have the ability to make you a ruler...that is what you want, isn't it Zephra?" Zephra responds, "That all sound very tempting but what do you get out of all this?" He smiles as he asks, "Why do you think I would want anything from you? perhaps I only wish to help you succeed in your endeavors." Zephra chuckles, "We both know that is not the case, You want something out of all this, Do not waste my time with your pretense." Zeref responds, "I admire your fiesty attitude, your courage, your royal postion, your skill and enjoyment for battle, most of all I admire your beauty. I want you to fight... not FOR me but WITH me, Let us conquer the Northern region together." Zephra listening says, "And then...." Zeref tells her, "become my wife and I will give you all of the Northern land to rule over on your very own, in addition... you will be in power and position as the Queen of my empire here in the East as well. My only request would be that your demon servants then fight for the East when needed." To Zephra this is what she has always wanted and to think that she will achieve a goal in her young years that takes the fiercest of demons hundreds of years to accomplish is more than she could have ever hoped for. Not only will she rule her own empire but she will be 2nd in command of his. Zeref has gotten her attention but she asks him, "Are your demons up to such a battle, Is your empire strong enough?" he responds, "The Eastern empire is one of the strongest and greatest. I have hundreds of skilled fighters also the Southern region supplies demons at my call and with you, there is no way we can fail to take over the Northern lands." she flashes him a flirting smile, "Lord Zeref, you certainly know the right things to say. I believe that arrangement should work out well for the both of us." Suzaku who has been standing by listening to everything is in shock as he thinks: What is she doing? I'm sure Zeref wants more out of that deal than just a powerful wife, she should be smart enough to know that. Before Zephra and Zeref part ways she tells him that they can begin the plans of the battle, she tells him that she will return in a few day and remain at his castle here in the Eastern lands so that they can begin to make preparations and follow through with the battle. Zephra has no intention of telling anyone what she is planning, not even her family however Suzaku was there and overheard the entire conversation. Zephra falsely informs her family that she plans to train in the Southern lands for a huge demon tournament that will be taking place there. She tells them she already has her team mates who all plan to spend several weeks training in that region and her lie fools her family as they wish her the best of luck. Rin lies in bed next to her husband, he looks over at her and can tell that she is troubled and he already knows what it is. Sesshomaru tries to comfort her by caressing her hair as he explains, "Zephra enjoys battle Rin, It is what she lives for and It invigorates her." Rin replies, "Hmmm yes, I know she is just like her father." Sesshomaru continues, " We can not stop her from aspiring her goals simply because she is a woman." Rin looks at Sesshomaru, "Her being a woman is not why I'm afraid for her." Sesshomaru asks, "Really? If we had bore sons instead of daughters, would you be so worried?" Rin informs, "Well I guess that is part of the reason but I hate unnecessary fighting and killing. These tournaments are needless. I'm afraid for Heroshya every year when he goes to these tournaments and I'm even more so afraid for her, she may be killed and it's even worse that she is a woman fighting powerful male demons." Sesshomaru tells her, "If we forbid her to go she will find a way to avoid our orders, you know how she is. We will just have to wish for her safety and well being." Rin asks, "Shall we not send Heroshya to be with her and see...." Sesshomaru interrupts, "Let her grow and follow her own path Rin. She will be fine, I have faith in her." Zeref's castle is huge containing many rooms and Zephra has a huge quarters of her own. For many days she and Zeref discuss their strategy for winning a battle over the Northern land and taking over that rulers empire. At night Zephra joins him at a huge table where they sit for dinner, He often times attempts to make his way into bed with Zephra but she does not allow him and informs that he will not lay with her until after they are married. Suzaku often times sees Zephra in passing around the empire and has been longing to speak with her but she is always in the company of Zeref making it impossible for him to get a moment alone with her. One night while Zephra bathes in a warm lake near the castle that is usually private for Zeref. Suzaku takes his chance and appears calling her name quietly, "Psst, Zephra." She looks up and when she sees Suzaku she ducts down further into the water as she says, "Do you mind, I'm trying to bathe. A little privacy would be nice." he tells her, "I need to talk to you, meet me right after you are finished. I'll be at the far side of the Eastern woods by Lord Zeref's big statue." He takes off for that area leaving Zephra to wonder: Oh what could he want now for goodness sake. After bathing she meets with him in the spot he asked her to and she asks him, "What is it now Suzaku, I am very tired. Zeref kept me busy studying maps of the Northern lands today and I...." Suzaku interrupts her asking, "What do you think you're doing with Zeref? I can't believe what's been going on here. How do you think Nephra or your own father would feel if they knew you were here spending nights in Zeref's castle!" Zephra asks," Oh great, do I need to worry about you telling Nephra? I know you are planning to see her tomorrow, I guess it's safe to say you are going to tell her everything." Suzaku responds, "I don't know, I won't be able to bear the devastated look on her face when she hears what you have been up to. Look, I asked you here because I think you should abandon this whole crazy idea, go back to the Western lands and be with your family." Zephra informs, "Suzaku I appreciate your concern for me but really, I know exactly what I am doing." Suzaku raises his voice, "Your betraying your father that's what your doing!!" Zephra responds raising her voice also, "My father has absolutely nothing to do with any of this and you are one to talk about betrayal, Zeref still does not know about you and Nephra. Why don't you just tell him that you plan to abandon him and his empire to marry his enemy's daughter!!" Suzaku says, "Maybe I will tell him now, he's doing it. Why can't I?" Zephra responds, "Exactly. You just worry about Nephra, I will handle Zeref and his empire." She starts to walk away when Suzaku shouts out to her, "He has some other trick up his sleeve, Although I don't know what it is I do know my master well. You had best watch yourself, I'm telling you this because I love your sister and I don't want to see her destroyed by your death. I would feel responsible for causing her anguish if I stood by and let it happen." Suzaku has the last word as he flies off to the West in order to see his beautiful Nephra by daylight the next morning. Back at Zeref's castle he and Zephra gather with the most skilled fighters of the empire discussing a strategy for winning the battle against the Northern lands. One demon speaks out, "The Northern demons are tough It will not be so easy to conquer them." Zephra responds, "That is why I have come up with a plan. We will trick them by bringing in only a few of our skilled fighters at a time. As more of our fighters join the battle, they will be more skilled than the last causing the North to underestimate us and giving us the opportunity to see how skilled their fighters are. As the demons sit and listen, Ryo is laid back; sleeping during Zephra's meeting. Zephra sees this as it causes her to pause in her sentence and narrow her eyes at him. She ignores Ryo's blatant disregard for the information she is giving to the demons and continues speaking, "In addition the Northern demons will tire and become weak after battling our least skilled demons, Once we bring in the real fighters they will not have a chance of defeating us." Zeref's demons nod their heads in agreement to Zephra's plan, Zeref listens on as Zephra continues giving instructions. Zephra points to a map of the Northern lands as she directs, "We will camp in this area over night and the main fighters will hide out over here near this wooded area until the signal is given for them to join in the battle. We will break the main fighters up into levels depending on their abilities from least skilled to the best... Zeref and I being the very last ones to join the battle defeating the last of the surviving demons." Zephra loves being in charge and giving directions to an empire of demons and Zeref knows it as he watches her with delight and admiration, she continues on, "We will have two or three flying demons near by watching the battle to give the signals for the groups to join when their turn approaches, Do you all know the signals?" They answer her, "Yes, My Lady." At this moment Ryo begins to snore loudly causing Zeref to scold him, "RYO!!" Ryo wakes up confused as he was sleeping deeply, "Huh?? Oh, Yes Milord?" Zeref continues to scold him, " We are planning a war here, you may want to pay attention. Show some respect for our soon to be queen of the East!" Ryo can no longer hold his tongue as he lashes out, "Master, this is ridiculous....We need not take orders from the enemy, least of all some useless half demon female." Zephra smiles at Ryo and informs, "Ryo, you sit with the servants as I give the orders. So.......of you and I.......who exactly is the useless one?" Ryo snarls at Zephra as she continues to tease him, " You will follow every order I give or you will not live to see another day, I will have you destroyed with just a snap of my finger...make sure you think about that before you cross me again Ryo." Zephra continues to glare at Ryo with a smug smirk on her face as she asks him, "Do you have any further objection? Don't be shy." Ryo angrily and reluctantly responds under his breath, "No Milady." Zeref observes this rivalry between the two and chuckles softly, impressed at how Zephra shut Ryo down so easily. Zephra dismisses the group, "Very well then we will retire for now, the next time we meet I will expect suggestions from each of you on some new fighting techniques we can use." The demons all scurry out of the large room as Zephra rolls up the map that she used to give her instuctions, Zeref walks up behind her placing his hands on her shoulders asking her softly, "Will you not be joining me for dinner tonight?" She responds " I must set out for my trip home to the West." Zeref removes his arms and backs up allowing Zephra to turn and face him, he then says, "I had hoped you and I would spend time alone these next two days." she responds, "I have been spending weeks with you, I need to see my family. I'm sure they are worried." She begins to walk away but he takes hold of her arm, " You know I will take care of your transportation back to the West, the trip should take you less than half a day. Spend this time with me now and head home later." Zephra sighs somewhat irritated by Zeref's nagging, " I will return in a fortnight." He continues "That is too long, Spend the night with me in my quarters and leave for the West in the morning." she denies his request as she has done many times before responding, "You will not bed with me until the day we are married." She pushes him away as she continues, "I hope I will not have to repeat myself again." Zeref is tantalized by her fiesty attitude and refusal of his advances, he tells her, "Very well then let us marry upon your return back here to the East." Zephra agrees to that as she heads home to see her family. When she arrives home after the long trip, Rin and Sesshomaru are very pleased to see her. Rin can barely control her emotion as she showers her daughter with hugs and kisses causing Zephra to respond, "Mother, Please...I'm home now and I'm alright." Rin tells her, "We recieved your note from a demon messenger saying you would be home today so I have made your favorite meal and that demon soup you love so much." She sits at the table eating and talking with her mother and father as she eventually tells them, "I'm sorry to say that I will only be home for a couple of weeks..I'll have to return to the South the training is still going on." Rin replies, "Zephra this has gone on far enough, I really think it's time for you to remain at home." Zephra says nothing as she is too tired to argue with her mother. Rin continues, " I think it's downright selfish of you to cause your father and I so much anguish, you have no idea...." Sesshomaru interrupts her, "Rin, we discussed this. Zephra is a woman now, old enough to make her own decisions." Zephra looks up and at her father with surprise that he has just taken her side as she asks, "Do you really feel that way father?" Sesshomaru responds "I trust that what ever choices you make, will undoubtedly be the correct ones. If you continue to put your life at risk, I suppose it is because you feel it is for a worthy cause. Though your mother and I do not agree with some of your actions, It would be wrong of us to stop you from persuing your mission in life." Rin leaves the table too distraught and unable to speak on the issue any further. Sesshomaru continues, " Your mother feels this way as well, she is allowing her emotions to get the better of her. " Zephra asks, "Father, If once I were to make the wrong choice and did something that disappointed you deeply, would you forgive me? would you still love your daughter?" Sessohomaru stands and only says, "Do you need to ask?" as he removes himself from the table walking off. As Zephra prepares herself for bed she hears a knock on her door, It is Nephra and she says, "Your home." She goes over to her sister and asks, " so how long are you staying?" Zephra says playfully, "trying to see when you will be rid of me already?" Nephra laughs, "Of course not silly. How is the training going in the South?" Zephra replies, "Pretty well, I feel we have a good chance at winning this tournament." Nephra shakes her head at Zephra, "You really weren't going to tell me the truth were you?" Zephra sighs, "So you talked to Suzaku, of course, I should've known." Nephra: Why would you keep it a secret from me, don't you trust me any more Zephra? Zephra: It's not that, I just already knew how you would react and I knew you would try to talk me out of it. Nephra: I don't understand this plan of yours, What do you expect to gain. You will still be under the orders of Zeref an evil demon that cares for no one, do you really think he loves you? Do you even love him? Zephra: Ha,Ha...love hasn't got a thing to do with it. Zeref is merely my puppet, he is so infactuated with me that I am able to manipulate him to do exactly what I want. Through him I will gain control over 2 empires, it is true that I will be 2nd in command to the empire in the East but I will gain complete control over the North. Eventually, I will birth a son and when my son comes of age he will be handsome, strong and powerful surpassing his father, making his name well know as he becomes ruler over half of Japan. That will please me very much. Nephra: You've got everything all planned out don't you? Well have you thought about our mother and father? How will you explain yourself when they find out that you are married to Zeref? Zephra: I would be protecting father's empire, as long as Zeref remains romantically interested in me he will more than likely not attack the West in fear of me leaving him in retaliation. Anyway father will forgive me..that I now know." Nephra: You can't trust him, Suzaku and I both believe that he is not as oblivious as you may think. Just as you are using him , he may be doing the exact same thing. Zeref is evil, no good can come from any dealings made with him. Zephra: Nepha, I am not worried about Zeref...I can handle him just fine. Now please I am very tired I must rest. Nephra turns to leave out of the room but stops to ask Zephra, "Perhaps we can go out to the lake for a swim tomorrow, we can pick berries like we used to and have mother bake a pie. I'm sure you'd like a berry pie before you travel back East." Zephra smiles slightly and says, "Sure Nephra, We will do that." Nephra leaves the room as Zephra snuggles under the blankets to sleep. One week and half has gone by and Zephra has been enjoying her time at home with friends and family. She sits in back of the castle looking out over the water in the hot spring; doing a lot of thinking about her plans to marry Zeref and gain empires through him. She thinks about her father, she knows that he will always love her and forgive any of her wrong doings but she wonders still can she bear the disappointment on his face when he realizes what she has done and how she has deceived him. She thinks about her mother, also realizing that it would be awful to cause her sweet mother so much distress over her daughter's well being. Zephra also finds herself replaying a conversation she had with Akimu just a few days ago as they enjoyed a walk in the forest together, he holds her hand while giving her a pretty flower with the other. Zephra asked him, "You have many demon friends that are from the East, what do you know about Lord Zeref?" Akimu tells her, "Aside from him being fierce and poweful? Nothing much I guess but it seems like he is on a mission to control all of Japan, I would hate to see that happen." Zephra inquires, "Do you think that he may be planning such a take over?" Akimu responds, "I really don't know but he is powerful and clever enough to." Zephra curls her lip in disagreement, "Clever?? I don't think so." Akimu assures her, "He really is crafty, he's quite the ladies man too." Zephra asks, "What do you mean?" Akimu informs her, "Zeref has been married four times but one would never know it because at some point in the marriage each one of his wives eventually disappear. I heard a rumor that none of them sit in position as queens in his empire but instead they are either never seen again or they live quietly in the demon village with the very children they bore with him, living only as his servants." Zephra does not react but she thinks to herself: He already has wives and Children!!?? Akimu continues, "If a demon woman has something he needs or wants, He is clever enough to get them to marry him, once he gets whatever it is he needs from them he simply rids himself of their presence, being first in command they must obey his orders...ha, but yet he keeps human slave girls with in his castle to be there at his beckon and call. If one of them have a half demon child with him, he simply sends her and the child back to the human village leaving her prospects of a normal life ruined." Akimu shakes his head, "That Zeref, I would not want to be servant to him, he is an evil one." Zephra's flashback ends as she thinks to herself: Zeref married those demon women and then cruely has them become his servants, He cares nothing for his own children to let them live in such a state. Would he dare to treat me and my child that way? he must know I am much too formidable to allow him to turn me into his servant. I never realized how evil he truly is. I do not love him and I could never love a demon with such a horrible soul. Zephra has another flash back of when she saw Suzaku and Nephra together once, the way they look at each other, the way they seem to absolutely adore each other and the sacrifice Suzaku is making for Nephra. Suddenly her mother and father flash into her mind, the way they have shown love for each other, her father would never even dream of treating her mother the way Zeref did his wives and children. She thinks about her father and what a wonderful family man he is as well as a great ruler....she thinks to herself: That is what I want for myself and my child, I deserve to love and be loved, my son or daughter should have a father that will be devoted and caring. I believe Akimu would be all those things. Zephra's deep thoughts are suddenly interrupted by Heroshya walking up to the hot spring as he asks her, "When did you get back?" Zephra responds, "I have been here for almost two weeks now, You would know that if you were home more often yourself." Heroshya asks her, "What's your problem?" Zephra tells him, "I have heavy things on my mind." Zephra looks at him in a way he never seen her do before, she has an expression of sorrow on her face as she continues, "I think I made a really big mistake, now I have to try and fix it." Heroshya came to her at the right moment as Zephra feels the incredible urge to pour out her feelings of regret. She tells Heroshya everything about Zeref, she finishes explaining her dilemma and says, "Now I must go to him and tell him that the deal is off. I just realized that I do not want to be in a loveless marriage, I don't trust him and I can not bring myself to cause my mother and father the anguish that will surely overcome them when they find out what I've done." Heroshya asks, "What is it with you and Nephra getting yourselves romantically involved with father's enemies?" Zephra gives Heroshya a look as she says, "Please I feel bad enough, spare me the lecture." Heroshya then says, "Alright, I guess you've learned a lesson. Well, I say you just stay away from the East from here on." Zeprha replies, "I can't, He will be sending his servants to take me back in three days. I will have to break it off with him, I got myself into this and I will get myself out." Meanwhile back in the Eastern lands at Zeref's castle, Ryo can no longer hold his tongue and must speak on the issues of Zephra becoming second in command. He has been a faithful and loyal servant of Zeref. Ryo knows he is not strong enough to be Zeref's second in command be he feels that a half breed should not be giving him orders. Ryo goes to his master Zeref and bows down to him asking, "Master, please forgive my questioning of your decisions but I must understand your motive, if I am to continue in your service. Why would you make this half demon of the West ruler over us...Over me? I have been your loyal servant for many years, how can that half breed come along and can dare threaten to have me killed?" Zeref replies, "Ryo, it is true you have been my servant for many years....so you should know me better than that." Ryo still confused , "Master?" Zeref continues, "I will give Zephra what she wants for now but in the end, she will serve me." Ryo informs, "Milord, I don't think she can be trusted, she's the daughter of Sesshomaru." Zeref explains, "Yes, but her brother Heroshya will take control over the Western lands when Sesshomaru passes the empire on. Zephra hates the idea of that, she wants to be ruler of her own empire. So I will give her authority over the East and North once it is conquered, She will be queen but I will be King and Supreme Ruler. Once I am her husband, she will be the one obeying MY orders." Zeref chuckles as he continues, "I think my first order of business will be to take complete control over her father's land and empire. If he wants a war then that's fine, his very own daughter will be forced to fight on our side. Sesshomaru will not allow his demons to harm her and he will surely give up his empire." Ryo inquires, "But Milord, what if Sesshomaru decides to fight you one on one for his land." Zeref laughs, "Heh, I will still have the upper hand. Once Zephra is my wife and under my command, I can do whatever I please with her, I will threaten to kill her.... with his precious daughter's life in my hands, do you really think Sesshomaru will refuse my request to take over his empire ?" Ryo now understands as he dons a sinister smile now knowing that Zephra will be queen but still servant and under complete control of Zeref. Ryo comments, "Milord, I knew that you were too wise and powerful to fall victim to a half demon." Zeref lowers his brows at Ryo as he scolds, "Then you should not have questioned me!! Now Go!! ....and Ryo.....I would tread lightly around Zephra if I were you, she is exactly right..... she does have the power to have you killed if you continue to irritate her." Ryo nods, "Yes Master." Three days later, Zeref sends a demon to retrieve Zephra as she had predicted. Nephra tells Zephra, "I will get Au Un, I am coming with you. I won't let you deal with Zeref alone. There's no telling what he will do when you break off the agreement." Zephra feels doubtful about that, "Nephra, I don't think it's a good idea for you to..." Nephra interrupts, "I'm coming with you that's it, I'll catch up with you once I get Au Un." She leaves to find Au Un for transportation. After many hours of travel they reach Zeref's castle and they both walk up to his throne, Suzaku stands behind Zeref and when he sees Nephra, he is instantly troubled by her presence as he thinks to himself: What is she doing here, It's not safe for her...I told her to remain at the castle. As they approach, Zeref takes notice of Nephra saying, "Well, Well..Isn't this a surprise. I suppose this is your sister?" Zeprha wants to keep Nephra safe so she does not answer him only speaking directly to the main issue, "Zeref, My stay here will be extremely short. I only came to tell you this in person because I thought It was fitting to do so. I no longer want to go through with the plan we agreed upon. I do not want to go to war with you and I do not want to marry you." Zeref remains in a calm voice, "I feared this would happen if you went back West, I was prepared for such news." Zeref turns his head slightly and looks over at Suzaku from the corner of his eye, "I suppose you will abandon me as well, You are planning to leave the empire for this girl aren't you?" Suzaku's heart races a bit thinking: That's impossible, How did he find out...who could have told him? Suzaku gathers his thoughts as he responds, "Yes Milord, I am going to marry Nephra...Sesshomaru's daughter and we will live in another region. I will no longer serve you." Nephra looks on saying nothing but anxious to get her sister and her fiancee out of the clutches of this evil demon. Zeref faces Zephra again as he stands and walks over to her slowly taking her hands in his, "Now Zephra, we have an excellent plan here and it will work if you give it a chance. Through me you will have everything you could ever want." He pulls out a beautiful, glowing gold ring and says, "This is yours, to unite us as one." Zephra responds, "It's possible that you may provide everything I want, except love. I do not love you Zeref, I could never love you." Zeref feels his blood begin to boil from her insolent words he thinks: How dare she turn me down, I am almighty and much more superior than she. She will repent her callous words. He takes his hand and wraps it around her neck, squeezing a bit. This does not affect Zephra as she shows no fear or emotion but Nephra does not like the way he is man handling her and prepares to unsheathe her sword. As he has a hold of her neck he asks, "You will not marry me?" Zephra slaps his hand away with much force freeing his grip from her neck as she answers, "I have changed my mind, my father would be most unhappy with me If I took you for a husband and I would regret my decision later, that I am sure of." Zeref responds, "I am very disappointed in you Zephra, You are causing me much heart ache." Zephra responds, "You have no heart, how can I break what does not exist." Zeref reaching his breaking point of her disrespectful words shouts, "I WILL SHOW YOU!!!" 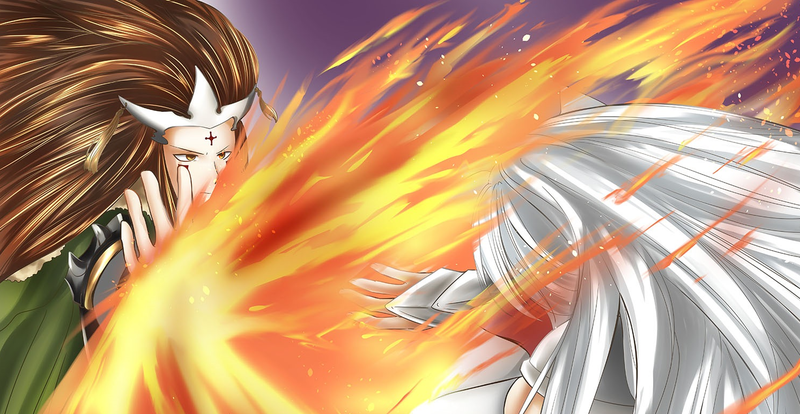 as he in one instant swoop, blasts an immense amount of demonic blaze at Nephra that goes directly through her body. Her small build is no match for his force as she goes flying off into the distance. Zephra can only scream out her name, feeling an incredible amount of despair as she runs to her sisters aid unable to hold back tears filling the wells of her eyes. Zeref laughs and says out loud, " How does if feel Zephra? Now you will feel pain to a heart that does not exist." Suddenly Zeref can hear Suzaku behind him shouting, " ZEREF, I WILL KILL YOU!!" Zeref looks back and sees Suzaku wielding his sword intent on destroying his former master for hurting Nephra but Suzaku's anger and hurt is so deep that he is unable to concentrate on fighting him skillfully. Suzaku slashes his sword over and over in a fit of rage but Zeref just laughs as he says, "Suzaku, I taught you everything you know. If you are going to kill me..you had better get your mind into it. Ha Ha." Suzaku replies infuriated, "You attacked the woman I love, I won't let you live!!!" He attempts a strong strike of his sword but Zeref blocks it as he laughs again, "Suzaku, My boy...you'll get over her and then once you have calmed down you can go back to serving as my right hand man again." Suzaku replies, "NEVER, You are evil...I'll never serve you again!!" He abandons the sword that seems to not be helping and uses a demonic power that transforms him into a huge hooved foot demon that has sharp horns on all fingers similar to the ones on his head. In that state it is easy for him to slash, pierce and puncture his enemy. He is moving his hands at lightening speed and attacking that Zeref finds himself stabbed, blood gushes out of him and he looks at his wound then looks up at Suzaku angry at his betrayal he says, "You would kill me over a mere half demon girl, I am the one that took you in. A worthless, sorry, wretched child that no one cared about or wanted." Suzaku says nothing but continues to attack him aiming to stab him a life threatening spot and he almost does but Zeref quickly turns into a lion demon himself and bites Suzaku in the shoulder with his mighty jaws. Suzaku moans in pain and Zeref turns back into his humanoid form striking his former servant a hard blow with his sword before leaving him to die. Zeref walks off assured that all has been handled, attacking Nephra to get his revenge on Zephra for canceling their plans and for showing such disdain for him; also fatally wounding Suzaku who attempted to kill him. Suzaku knows that Nephra is dead. The demonic blast was so powerful not even a full demon would survive it. Suzaku can not bear to look at her lifeless body so he stumbles to a wooded area where he can heal from his wounds without fear of Zeref coming back to finish him off but he vows that when he is healed, the fight will continue and he won't rest until Zeref is destroyed.